Due to overwhelming request, Pokebattler is adding 2 additional new contests, giving raiders a much longer time to compete. Who can solo Deoxys – Attack Forme in the shortest amount of time. This new contest will run for much longer, ending on March 31 2019 or when a new ex raid replaces Deoxys – Attack Forme, whichever comes first. No rain or fog weather boosts are allowed due to their rarity. You may fight in the rain or fog but may not use weather boosted attacks. Other weather boosts are fine. Legacy moves are allowed (Gengar says hi). Raid lobby rejoin trick is allowed. You don’t need to catch Deoxys for it to count. Each winner will receive $100 cash and a year-long Contest Winner Subscription on Pokebattler, equivalent to a Fanatic Subscription worth $240! Cash prizes are paid via Paypal. If for any reason there are multiple videos that are both deemed to be equivalent, the prize money will be split and all winners will receive their subscription. Winners of 2019 Pokebattler contests are not eligible to win prizes but may receive bragging rights. The best submission that is not from a previous winner will be used in that case. Sorry Kieng! Video capture yourself playing the game and send us the raw unedited video using Dropbox or Google Drive to [email protected] The entire fight plus at least 5 seconds of lobbying that shows all the Pokemon used must be included. No cheating allowed of any kind, including spoofers. 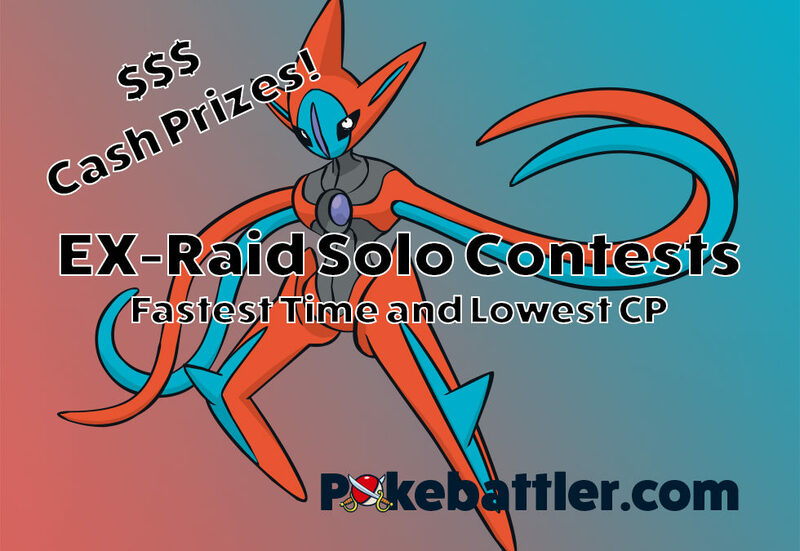 The contest starts January 19, 2018 5:00 PM Pacific Time and ends March 31th, 2019, at 11:59 PM Pacific Time (meaning West Coast USA GMT-8), or whenever Deoxys – Attack Forme is no longer available, whatever comes first. Your video must be in our email box by then to be considered. Note: Due to the impossibility of verifying whether the winner completed the ex raid on December 28th, any submission with a valid Deoxys – Attack Forme kill will be accepted, even if it was performed on December 28th. unless submitted in the prior contest. Multiple video submissions within 30 minutes of each other will be deemed a tie. To win the shortest time contest, we will be using look at the very last number seen on the screen when the swap button disappears. Tie breaker will be whoever gets their video to me first. To win the lowest CP contest, the CP of all the Pokemon you used will be added up to get a total number. The lowest total number wins. So whether you used 4 mons or 12, each one’s CP will be added. If you use the same one twice, it will be counted twice. If the last one you use is only used for a short time, the full CP will still be counted. Tie breaker is far less likely here but will also be based on submission time. We will feature your video on our Youtube, blog, twitter and reddit channels with commentary. If you win, we’ll ask details on the battle including the IVs and movesets of each Pokemon you used and any other interesting details you want to share. We’ll also want to share your Pokebattler ID if you have an account (even a free one) and make battle parties under it to use for links. You may also post your video to your own social channels. Make sure you check out our Deoxys – Attack Forme Raid Guide and our Raid Advice tool for ideas on which mons will help you defeat Deoxys the fastest. We highly recommend our raid simulator will give the most accurate times using your own Pokemon and battle parties. Good luck! Updates as to the current times and cps to beat will be updated here here. Winner will be chosen within 24 hours of the contest ending. Video will be up within 72 hours. You must give Pokebattler.com the rights to use the video in any way we deem fit to win the prizes. We will share whatever information you are willing to give, but trainer name and general location is a minimum. We or a 3rd party of our choosing are the final judges of the end time of any fight. Photo finishes go to the first submission. Odds of winning depend on your skill and how many people try for this contest. You also have to get lucky and get an EX Raid. So, this 153 seconds has been unconfirmed for a week. Are we going off an unconfirmed time????????? Please do something about this time or tell the person to confirm. Thank you Celandro. I just recently sent you a lowest CP video and screenshots. When you have a chance please check for me and thank you! It is over, I am very busy right now will double check this Saturday. There is a last minute submission for lowest cp that is going to have to get at least an honorable mention.